If you are reading this, the chances are that you’ve decided to take control of your investments. You may have been investing for some time but feel you could do better. Many of you may be new to investing, or have previously left the management of your money to professionals, and are thinking of taking the plunge and going it alone. Is this the right thing to do? Can you really be trusted to grow the value of your savings? There’s a massive financial industry out there that will say “no” to both these questions. My view is that anyone can be their own portfolio manager if they want to. That said, it is not easy and you have to be prepared to work hard and ask yourself some tough questions. But, yes, you can do it and you can do it well. For years though, people saved for their futures by handing over their hard earned money to somebody else to look after it for them. Many had – and still have – no interest in the stock markets. Others believed that they couldn’t hope to make more money than professional fund managers who spend many hours studying companies and their shares every day. Just as the internet has revolutionised other areas of our lives by giving us more information and cheaper prices, it is now beginning to feed through to the world of investment too. It is allowing more of us to take control of our own money and our financial futures. This is possible because information that used to be difficult or time consuming to get hold of is now generally available to everyone with a few clicks of a computer mouse. The internet has gone a long way to levelling the playing field between professional and private investors. People are slowly waking up to the fact that despite the hard efforts of professional fund managers, they can actually do as good or better job looking after their own money for themselves – and do it for a lot less money. The availability of self invested personal pensions (Sipps) and individual savings accounts (Isas) combined with online stockbrokers that give the ability to buy and sell investments cheaply over the internet has created an army of private investors who are now their own fund managers. On top of that there have always been people who play the stock markets for fun as well. The do-it-yourself approach has a lot going for it and can be very rewarding. However, I don’t want you to think for one minute that it is an easy option. You don’t need a high IQ to get a satisfactory performance from your portfolio, just lots of common sense and an ability to stay calm will suffice. But there’s no escaping from the fact that to be a good investor takes discipline and a lot of hard work. Managing your own money in the wrong way is the road to financial misery. This is where SharePad comes in. Information about a company’s finances is freely available. Your broker’s website will undoubtedly provide you with a company’s abbreviated financial statements for the last few years at no extra cost. But it’s what you do with that information that matters not the fact that you have it. This is why SharePad was created. I spent thirteen years earning a living as a professional investment analyst. A large part of my working days were spent wading through company accounts and crunching numbers. It would often take me weeks of putting numbers into spreadsheets and performing long financial calculations before I began to understand the company I was studying. That’s because SharePad has calculated lots of important numbers for me and turned the financial data that is available in lots of places into valuable information that isn’t. It allows me to do other things as well. I can see how many shares the directors own and whether they have been buying or selling recently. I can read the latest financial news and stock market chatter about the company and check when the next dividend will be paid or the next announcement is due. In short, I don’t have to go anywhere else to learn about a company and its shares. Instead of slaving away for hours, SharePad has done all the hard work and calculations for me. It is my own personal stock market analyst. That would be pretty good if that’s all that SharePad did but there’s more clever and useful things it can do. The software allows you to filter the UK and US stock markets for shares that meet set criteria. This allows you to perhaps look for things that other investors are not which may give you an edge. You can search through hundreds of different shares in as simple or as complicated way as you want. If there’s a share that matches what you are looking for, SharePad will find it for you. For example, you can look for shares that are really depressed and out of favour which are hitting new lows. Then you can check out their finances and see how cheap or expensive the shares are all at the same time. There are literally hundreds of different combinations you can use to look for winning investments. 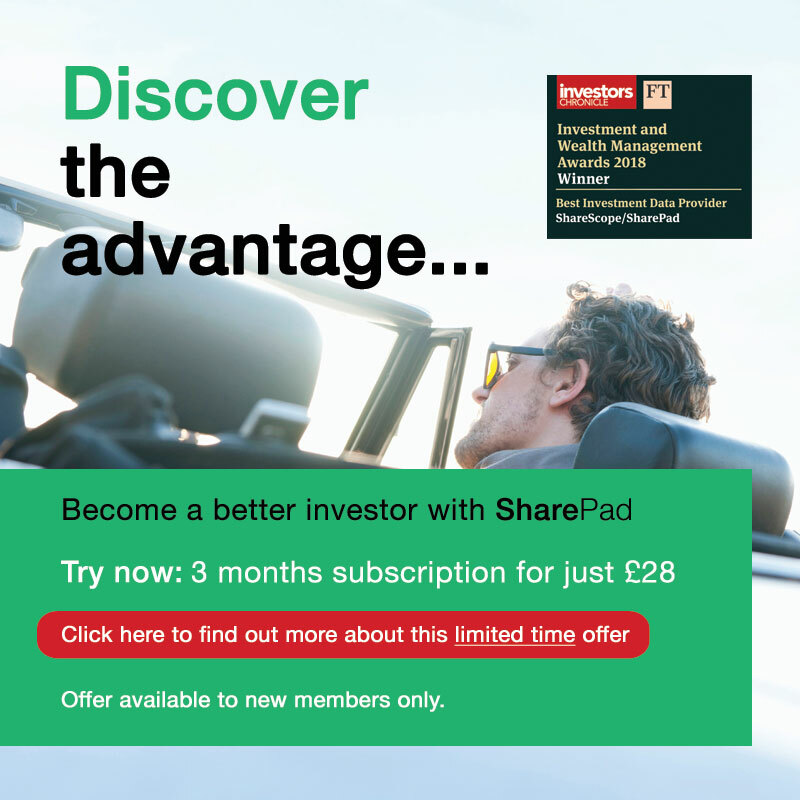 If you find a share that interests you, SharePad allows you to set an alarm for when it meets a certain price, or when an announcement is made or a director has bought or sold shares. When an alarm is triggered, SharePad sends you an email to let you know. This means you don’t have to spend all day chained to a computer screen or having to trawl the internet to find things out. You can get on with more useful things instead. Once you’ve set up your portfolio you can monitor it in SharePad. You can apply lots of clever tools to it to keep you informed and make sure that it is doing what you want it to do. And you don’t need to be at home or in an office to keep an eye on things. As long as you have an internet connection, you can check out your portfolio on your smartphone or tablet device from anywhere in the world. SharePad is not just about shares either. It gives information on investment funds, bonds, commodities and lots of economic data. If you want to chart data and put it into a document or presentation for your fellow investors you can do that. You can email it to your friends if you like. You don’t need to have SharePad in order to learn from this guide but you will need SharePad if you want to put it into practise. Put it this way, if I was a professional investment analyst today, I would want to use SharePad for everything. It gives you, the private investor, everything you need to get better results – for an extremely modest price. Professional investors can pay tens of thousands of pounds per year for tools of this quality. I use SharePad to manage my pension and Isa investments and am constantly amazed at what it will do. I also know that over the coming months and years that it will become even better and do more clever and helpful things. I think it’s something that every investor should use. However, with SharePad you will get more than just a piece of clever investment software. The problem with lots of software is that no-one really tells you how to use it. We don’t want SharePad users to feel that they’ve been left to fend for themselves. With this investment analysis manual, I will be showing you how to get the most from SharePad. I’ll be using my experience to teach you how to understand company finances, how to value shares and how to practice certain types of investing. I’ll be telling you what to look out for and how you can avoid simple mistakes. On top of this, read my weekly articles on our website. These will offer further guidance, often using topical examples, to help you put theory into practice. I hope that you will find SharePad as rewarding and useful as I do.